My assigned table is good for four persons. I was so damn bored last weekend. When I am in this condition, I reward myself with sweets, food and visit to any interesting place (not necessarily mall). Cruise dining is one in my wish lists but not that day yet. As often, when I plan a getaway, it does not happen but when unplanned, it happens. Since I do not use any credit card and my Paypal is empty as well, I had to call the booking office of Suncruises if I can still be accommodated for early dinner. The 6 p.m. dinner is fully booked therefore, I had to choose the earlier one, 4:15 p.m. onward. 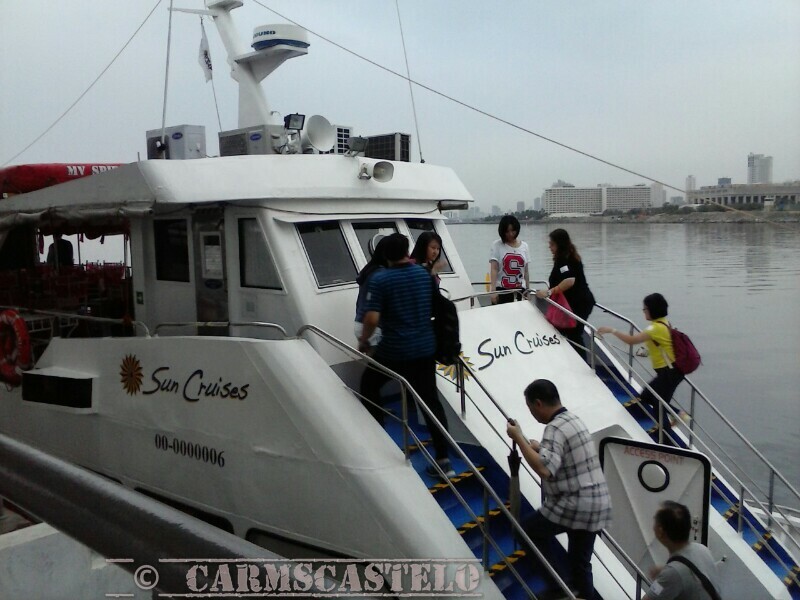 It is an hour and 30 minutes cruise in Manila Bay with dinner buffet and live band. Suncruises Reservation Office in Pasay City just beside Prestige Cruise office. I called on the booking office and reserved for a seat. They usually get the complete name of the guest and age. Passengers should be in a manifesto when in Manila Bay. In case any untoward incident happens, everyone has to be accounted for. A reference number was given to me and I had to be at the Esplanade Seaside Terminal - Suncruises Booking Office at 3 p.m. for me to pay the fees. From Mondays to Thursdays, regular rate for cruise dinner (plated) is 550 pesos per person while on Fridays, Saturdays and Sundays; dinner buffet is available at 650 net per person. Immediately after paying for the cruise dinner, I had to pay for terminal fee at 30 pesos per person. 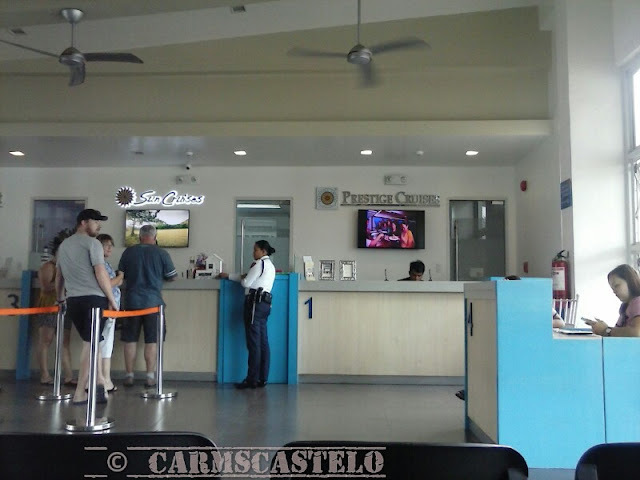 The place where the booking office is located is called Seaside Terminal, which is along Seaside Boulevard, Mall of Asia Complex in Pasay City. The seats in the upper deck have been booked that is why I was assigned to a seat in the lower deck. Before boarding, it is compulsory to have the sticker put on the guest's dress. The Suncruises booking office provides the sticker immediately after paying the dinner buffet and the terms and conditions of the cruise. 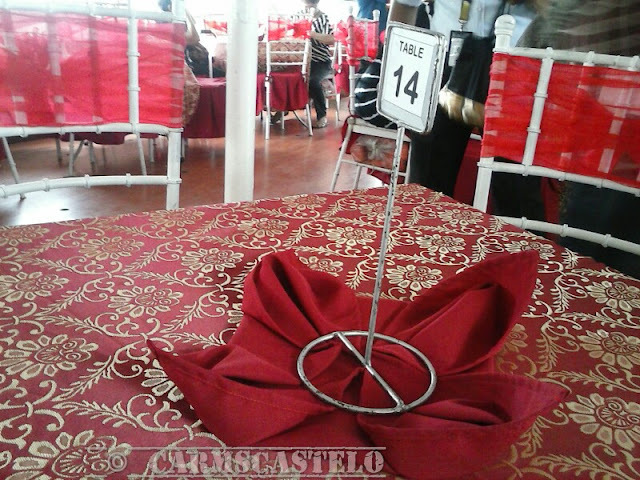 It contains the name of the guest and the table number where he or she has to be seated aboard. The Seaside Terminal opens with the security guard inspecting the sticker and the terminal fee before boarding. I was the only guest who was just alone while the rest came by two's or more - some families, foreign tourists and pairs. I seated in table 14 which is good for four persons. The motif inside the cruise was still Valentine, no wonder, February had just came past. 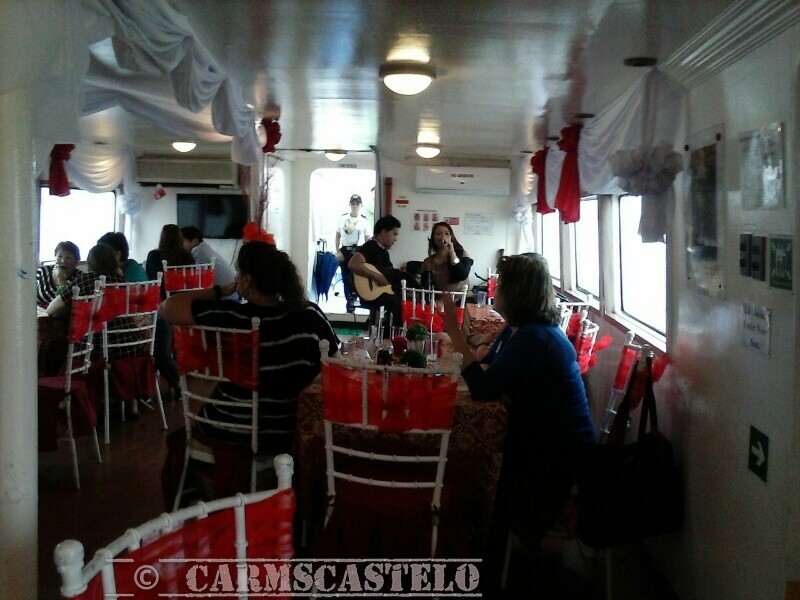 On board is music being played and live band with acoustic guitar while the buffet dinner is already open. The crew were accommodating while there was a Filipino pair who used to take too much pictures - no wonder, Filipinos. I hadn't had much pictures, not even by myself. 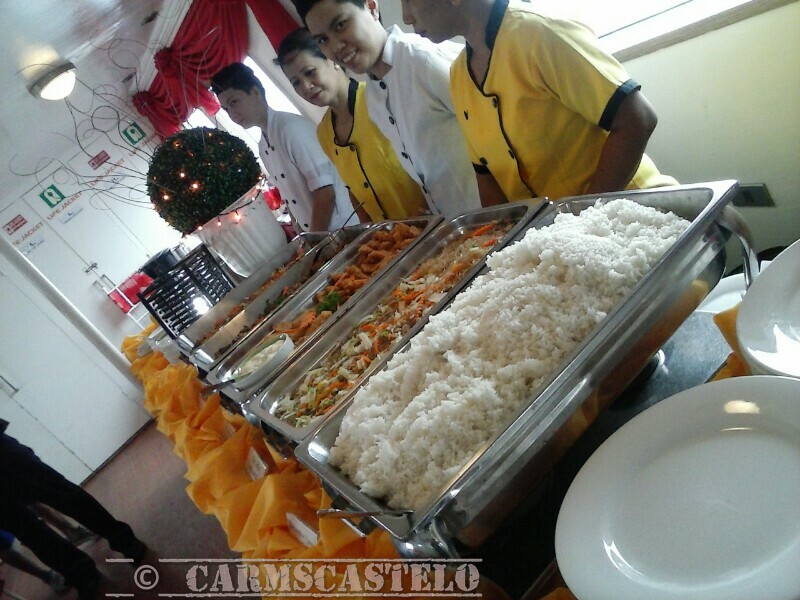 Unluckily, I was disgusted with calls that are work-related while I was already savoring the food. I had to stop for a while and answer all calls and make calls pertaining to office concerns. My goodness! Going back to the food, there were several courses. I liked the pork very much. The sesame seeds in the beef tasted well. The sotanghon gave a Chinese taste. Two types of desserts and some crackers added more. The one I loved because I missed to have - brewed coffee. 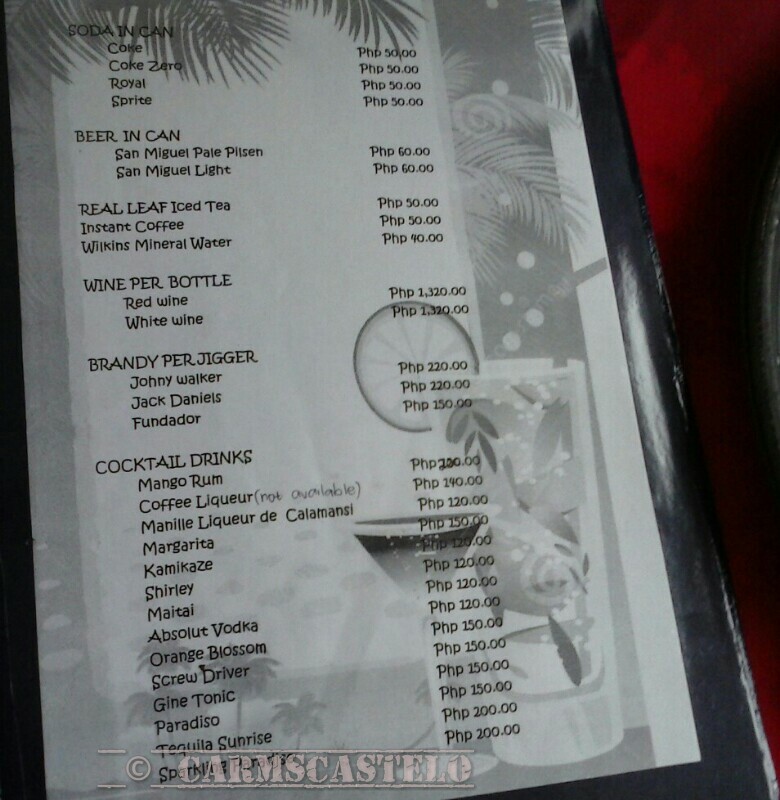 If you are not contented with the food yet and wanted to order more drinks, there are more to order while on board for a separate fee. Lucky that I was seated next to the buffet table; people from the upper deck had to move down to get their food and go back upstairs. I can get more coffee and take more viand. Despite going there alone, it was another food experience I had. Although last year, I cruised Manila Bay buffet was not included in the package. This time, I was so full that I did not eat breakfast in the next day. Well, my next destination being planned - Corregidor!